The importance of having a well mixed song! If your music is not mixed well, it will be a turn off to your fans. Plus, it will make you look very amateur. You should make sure your music is mixed well, and mastered well. If you can write and produce music that is timeless, it will help your music career in the future. The truth about major record contracts! There are many ways to bring in money with your music. It does not end at selling CD's, and digital downloads. If you think outside the box, you can bring in many different streams of revenue. Writing a business plan for an album release! 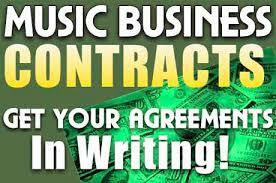 Always have a contract when doing business in music! It is very wise to have a contract drawn up when doing any kind of business. Even if you are just an indie artist starting out, it is smart to do it, just to keep both parties to their promises. Networking is something you need to do in order to have an amazing music career. You never know who can help you in the future. Plus, it makes you look more professional.